Indscribe's Blog: News and Views about Indian Muslims: Boy holds gun at RSS function: What he is aiming at? Boy holds gun at RSS function: What he is aiming at? 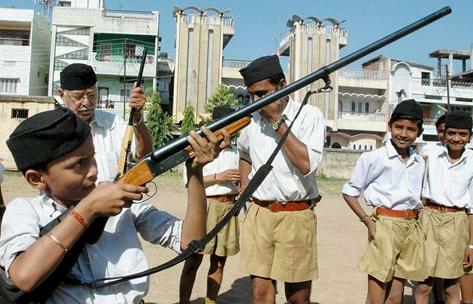 The photograph shows a child, a member of the Rashtriya Swayamsevak Sangh [RSS], holding a rifle. What he is aiming at, I have absolutely no idea. Is this the age for a boy to be handed the weapon? All fundamentalist organisations irrespective of the region and religion, indoctrinate early. I just hope that the boy who is associated with Sangh quite early in his life, doesn't believe that all Muslims are his enemies!